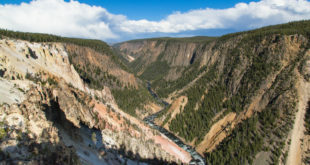 All park roads, save for the one connecting the North and Northeast Entrance, were slated to close to wheeled traffic today at 8 a.m. Yellowstone closes these routes annually to prepare for the winter season, when the roads reopen to snowcoaches and snowmobiles. Technically speaking, most Yellowstone roads closed Friday, when a snowstorm shuttered every interior route besides the North-Northeast Entrance road. This left a small window of time for crews to clear the roads before the scheduled closure. The majority of roads will reopen to snowcoach and snowmobile travel Friday, December 15. Yellowstone’s winter facilities will reopen the same day. The Sylvan Pass, connecting Fishing Bridge and Yellowstone’s East Entrance, will reopen Friday, December 22.